NEW ZEALAND, Wellington, November 18, 2016 – Leading games publisher PikPok® today announced the launch of their new original title, Rival Stars College Football, for Android on Google Play, and iPhone, iPad, and iPod touch on the App Store. 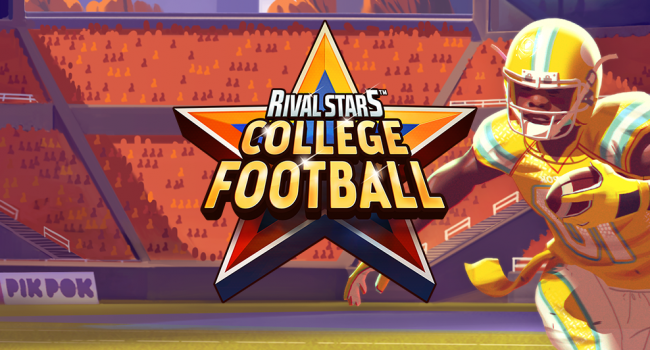 Rival Stars College Football is the second entry in the Rival Stars lineup, joining the hit card collection and strategy game Rival Stars Basketball launched by PikPok in 2014. The latest game builds on a slew of successful PikPok sports titles including Flick Kick Football Legends, Flick Kick Field Goal, and Slam Dunk King. In Rival Stars College Football, gamers are challenged with building a legendary college football program. Combining elements of card collection, tactical management, and strategy, Rival Stars College Football has gamers carefully balancing the positions and skills of athletes and building a dynamic playbook in search of ongoing victory. Players compete in individual, weekly, and multiplayer tournaments to move up the ranks and transform their unproven team into American Legends. Whether players choose to play it safe or call riskier plays for bigger payoffs, the fate of the team rests entirely in their hands. Featuring nail-biting, stats laden gameplay and the vibrant style of the Rival Stars franchise, Rival Stars College Football is a game of intense strategy amid escalating challenge, choice, and power. Hundreds of athletes to recruit, train, and level up. Build your campus, boost player performance, and propel your team towards legendary status! Deep strategic content that allows you to manage your team, your way. Analyse the competition and the stats, make tough decisions, and call the plays! Game highlight moments – witness the hard hits and big plays up close! Action-packed live global tournaments that have you going head to head against real world opponents! Rise through the ranks to win big rewards! Multiplayer alliances for you to join or form! Share strategies, chat with friends, and compete against rivals to be the best! A trailer for the game can be viewed at https://www.youtube.com/watch?v=S4WZttMnmUg, and media and more information about the Rival Stars College Football app can be found at www.pikpok.com/games/rival-stars-college-football/. The Rival Stars College Football app is available for free from the App Store on iPhone, iPad and iPod touch at http://l.pikpok.com/itunes/cf or from Google Play on Android at http://l.pikpok.com/play/cf.